Google Calendar has become a must-have business tool in addition to being a popular choice for a personal schedule manager as well. And while there are a number of calendar apps available that help to increase the productivity in our increasingly busy lives, most Gmail users prefer Google Calendar. Widely considered the most popular scheduling app downloaded and used daily by millions, Google Calendar still has many undiscovered features that its millions of users have yet to explore. In this article, our goal is to introduce a dozen of Google Calendar’s hidden time-saving features which the Copper team have found to be fantastic productivity accelerators. 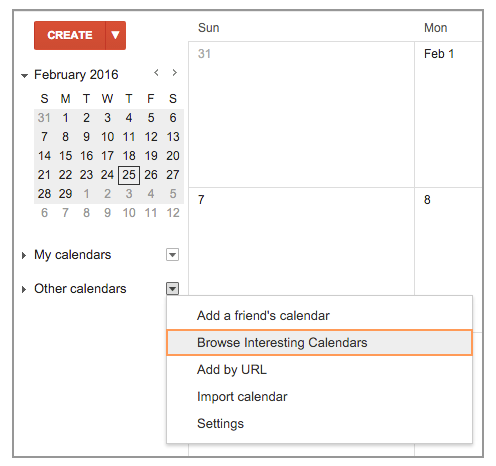 As with all Google tools, Google calendar works smoothly with the Copper CRM. Quick Add allows you to quickly “add” an event to your calendar without having to manually search for the date and time of that event, as you normally otherwise might. To use, simply select the arrow next to the Create button, then type in your event, day and time. Please note that if you input “Friday”, Google Calendar will automatically add the event to the nearest Friday. Ever wanted to quickly view your schedule for the next 5 to 10 days or even 2 weeks? On the left hand side of your Google Calendar, simply drag and then select your date range, and the view is all yours! If you frequently deal with clients based overseas, the World Clock feature is a perfect addition for you to easily keep track of their local time. Websites like worldtimebuddy.com are great for calculating timezones—and your office hour crossovers—but if your business demands that you view their local time, World Clockwill always keep it displayed on the side of your calendar for your convenience. 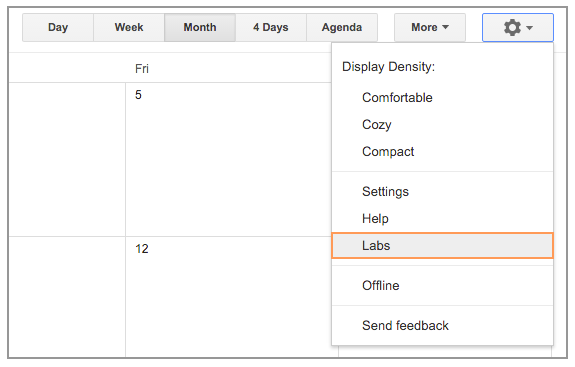 To set this up, go to your calendar settings, then select Labs. With this feature, you’ll see a number of experimental features you can test, but just navigate to World Clock to enable your particular setting. When you return to your calendar, you’ll see it conveniently displayed on the right hand side. 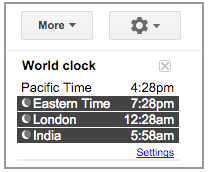 Then simply click on Settings to add the time zones you require! Why not receive a Daily Agenda so that you can see what your day looks like the very first thing in the morning, or even check it quickly on your commute. With Daily Agenda, you can plan ahead and then prepare for your day with ease. 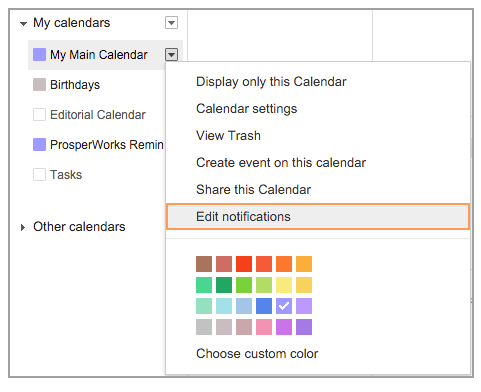 To set this up, select the dropdown menu next to your main calendar, then select Edit Notifications. Your options will then display, so navigate to Daily Agenda and select Email, or SMS (if you wish to receive it as text). Make sure your mobile settings are activated as well. With so much going on in our personal and professional lives, it’s often easy to neglect one for the other. As most of us prefer to keep our personal and professional accounts separate, you can connect your personal calendar with your business calendar to conveniently track your personal dates/times all within your business account. And your friends and colleagues won’t see your personal events- unless you choose to share them. To do so, under your personal calendar, navigate and then select—Calendar Settings. Choose the Share this Calendar tab to add your work email. You can then select options to make it either Public or Private. Then return to your work calendar, where you’ll see your personal calendar for your exclusive display. Have you heard or used the phrase, “decision fatigue”? It’s the condition that sometimes occurs when you spend too much time trying to make certain decisions. Be they small or life-changing, you’re likely expending a great deal of time and energy and creating an unnecessarily amount of stress when you have to make these choices everyday. Embedding Weather in your calendar is a little trick to eliminate at least some of this decision fatigue and also save you time otherwise spent worrying about things like what to wear or which route to take on your daily commute. On your Google Calendar, select—Settings under General, type in your location, then in the Show Weather based on my Location section, choose Celsius (C) or Fahrenheit (F). Once you save and then return to your calendar, you’ll see your local weather displayed for the next 3 days. If you find the World Clock feature useful, we recommend you explore the International Holidays feature in your calendar as well. 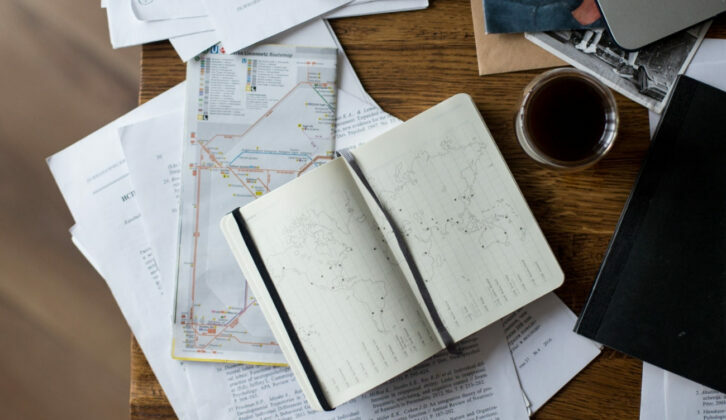 With this feature, whether you have another office overseas or clients in other countries, you can conveniently get to know their schedule and holiday timelines ahead of time. A bit of the personal touch can really carry the day. To add International Holidays, go to Other Calendars then select—Browse Interesting Calendars. Select from a list of International Calendars and other listed cultural/religious holidays. Under the same Interesting Calendars section, you can find your favorite sports team in whatever league you follow and this feature will automatically import the game schedule for your team into your own calendar. Whether to explore shared interests with your clients or simply to use it for your personal enjoyment only, it’s a fun feature to spice up your calendar everyday! If you’ve ever attempted to set up a meeting with multiple people from your team, we all know what a hassle it can be to find a time that fits everyone’s schedule. Luckily, Google Calendar has a Suggested Time feature which conveniently allows you to save time and trouble during this process. 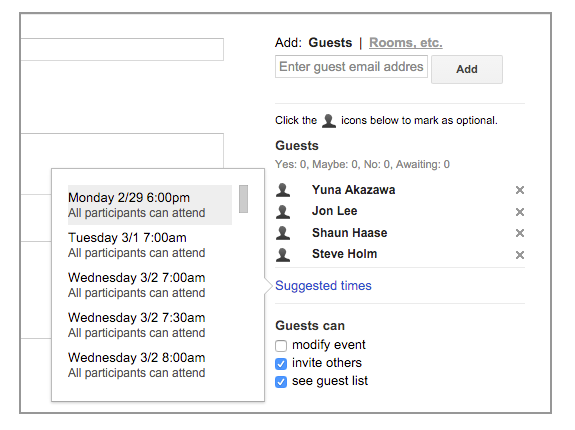 In your event, select—Suggested Times under guest names, then select a preferred time. Or as another option, you can simply go to the Find a Time tab next to Event Details and then select an open slot with the blue dashed box. 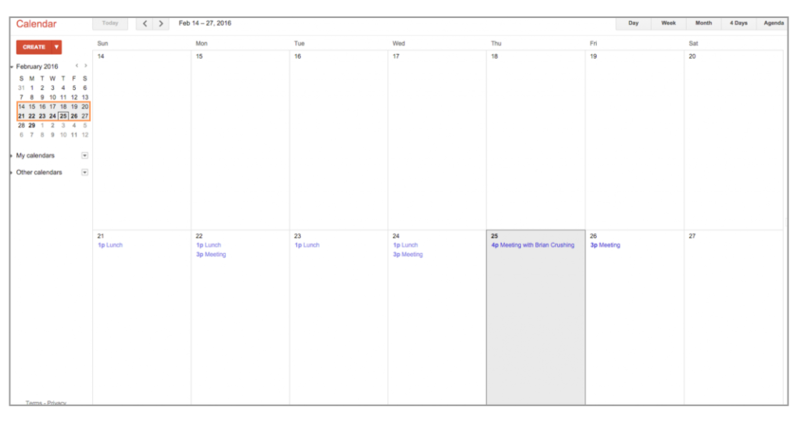 Anyone who’s an avid user of Google Calendar should take advantage of this nifty magic trick. 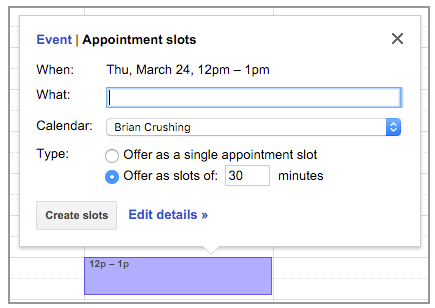 Appointment Slots allow you to select your available time range and then let your clients select the slots that fit their schedule. This eliminates the mundane, time-consuming task of going back and forth via email while trying to schedule a mutually convenient meeting. This feature is really handy for anyone, whether you’re a salesperson that needs to efficiently schedule multiple demos, or a real estate agent dealing with multiple viewings. To set this up, select a time range on your calendar and go to the Appointment Slots tab to create your schedule. But you can also edit your event to customize your slots even further. All you need to do now is to send this link to your clients. Clients can then book appointments for the times that best suit them. In this way, you can effectively eliminate the needless back-and-forth, and you no longer have to manually add these events. You can also use this in your drip campaign to easily allow any prospects to sign up for a call without the trouble of having them reply, or the mistake of reaching out to them while they’re busy. Ever missed a meeting even when you’d checked your schedule earlier? It happens. Why not save the time and trouble by adding the Next Meeting Countdown feature. Under the settings Labs section, select the Countdown option, then when you go back to your Google Calendar, you’ll know exactly how long you have until your next meeting. 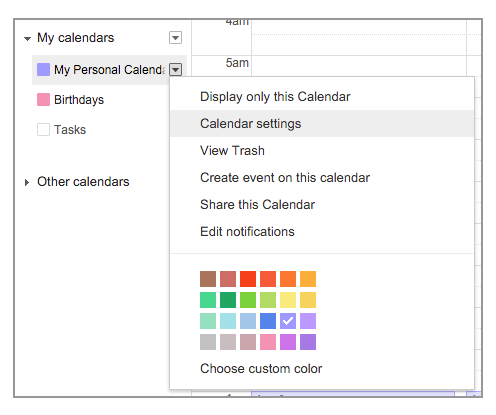 You can easily transfer the Ownership of any calendar events you’ve created on your Google Calendar. First select the event whose Ownership you’d like to change. Then select More Actions to Change Owner. Enjoyed our list? We’re sure you’re on your way to being more productive already but please feel free to comment or share your own favorite Google Apps tips too! Have you tried Copper's Chrome extension to sync your Gmail account so everything will be in one place? Sign up for our free trial today! Need to keep your team on track? From time audits to efficient meetings, here are 5 things you can start doing now to improve your team’s task management. tart your new gig off on a strong note with this list of different task management techniques, the pros and cons of each, and helpful app suggestions. Want to brush up on your sales skills and be a true rockstar on your team? Here are 11 prospecting books about essential sales psychology and tactics.